In which we create a Pinboard.in workflow ready for mass consumption. 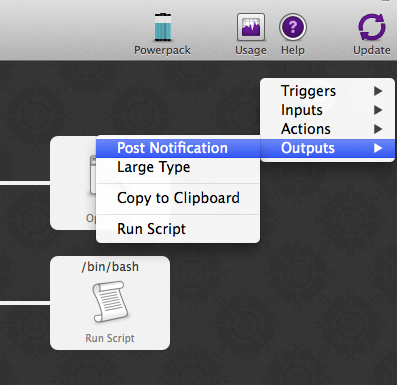 In the first part of the tutorial, we built a useable workflow to view, search and open your recent Pinboard posts. The workflow isn’t quite ready to be distributed to other users, however: we can’t expect them to go grubbing around in the source code like an animal to set their own API keys. What’s more, an update to the workflow would overwrite their changes. So now we’re going to edit the workflow so users can add their API key from the comfort of Alfred’s friendly query box and use Workflow.settings to save it in the workflow’s data directory where it won’t get overwritten. To set the user’s API key, we’re going to need a new action. We could write a second script to do this, but we’re going to stick with one script and make it smart enough to do two things, instead. The advantage of using one script is that if you build a workflow with lots of actions, you don’t have a dozen or more scripts to manage. We’ll start by adding an argument parser (using argparse ) to main() and some if-clauses to alter the script’s behaviour depending on the arguments passed to it by Alfred. Quite a lot has happened here: at the top in line 5, we’re importing a couple more icons that we use in main() to notify the user that their API key is missing and that they should set it (lines 65–72). We’ve adapted get_recent_posts() to accept an api_key argument. We could continue to use the API_KEY global variable, but that’d be bad form. As a result of this, we’ve had to alter the way Workflow.cached_data() is called. It can’t call a function that requires any arguments, so we’ve added a wrapper() function within main() (lines 82–87) that calls get_recent_posts() with the necessary api_key arguments, and we pass this wrapper() function (which needs no arguments) to Workflow.cached_data() instead (line 89). At the top of main() (lines 39–49), we’ve added an argument parser using argparse that can take an optional --apikey APIKEY argument and an optional query argument (remember the script doesn’t require a query). Then, in lines 55–59, we check if an API key was passed using --apikey. If it was, we save it using settings (see below). Once this is done, we exit the script. If no API key was specified with --apikey, we try to show/filter Pinboard posts as before. But first of all, we now have to check to see if we already have an API key saved (lines 65–72). If not, we show the user a warning (No API key set) and exit the script. Finally, if we have an API key saved, we retrieve it and show/filter the Pinboard posts just as before (lines 78–107). So let’s add that functionality now. Pass it to a second action to save it. A Script Filter is designed to be called constantly by Alfred and return results. This time, we just want to get some data, so we’ll use a Keyword input instead. It won’t do anything yet, though, as we haven’t connected its output to anything. 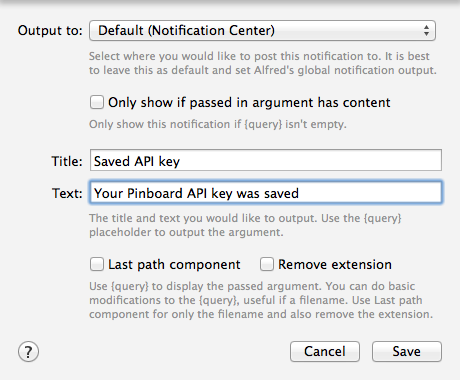 Now you can call pbsetkey in Alfred, paste in your Pinboard API key and hit ENTER. It will be saved by the workflow and pbrecent will once again work as expected. Try it. Try setting your API key again with pbsetkey and this time you’ll get a notification that it was saved. Saving the API key was pretty easy (1 line of code). Settings is a special dictionary that automatically saves itself when you change its contents. It can be used much like a normal dictionary with the caveat that all values must be serializable to JSON as the settings are saved as a JSON file in the workflow’s data directory. Very simple, yes, but secure? No. A better place to save the API key would be in the user’s Keychain. Let’s do that. Workflow provides three methods for managing data saved in macOS’s Keychain: get_password(), save_password() and delete_password(). They are all called with an account name and an optional service name (by default, this is your workflow’s bundle ID). get_password() raises a PasswordNotFound exception if the requested password isn’t in your Keychain, so we import PasswordNotFound and change if not api_key: to a try ... except clause (lines 65–72). Try running your workflow again. 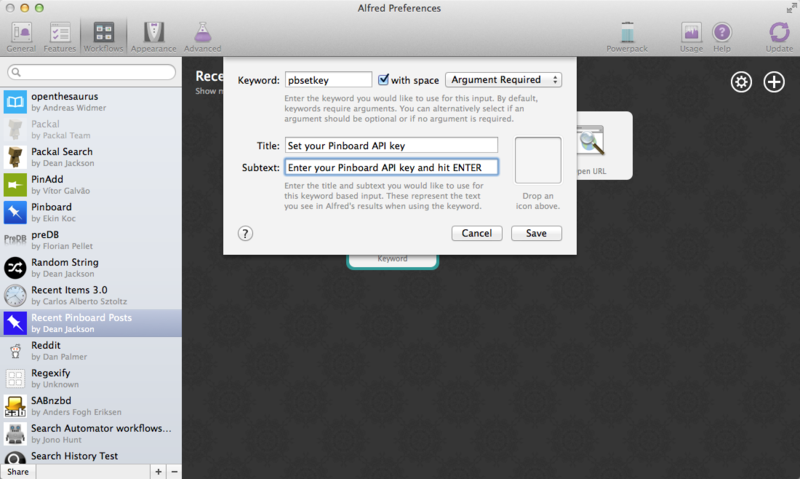 It will complain that you haven’t saved your API key (it’s looking in Keychain now, not the settings), so set your API key once again, and you should be able to browse your recent posts in Alfred once more. As a bonus, if you have multiple Macs and use iCloud Keychain, the API key will be seamlessly synced across machines, saving you the trouble of setting up the workflow multiple times. Now that the API key is stored in Keychain, we don’t need it saved in the workflow’s settings any more (and having it there that kind of defeats the purpose of using Keychain). To get rid of it, we can use one of Alfred-Workflow’s “magic” arguments: workflow:delsettings. Alfred-Workflow has recognised one of its “magic” arguments, performed the corresponding action, logged it to the log file, notified the user via Alfred and exited the workflow. Magic arguments are designed to help coders develop and debug workflows. See “Magic” arguments for more details. Assigning Workflow.logger to the module global log is just a convenience. You could use wf.logger in its place. So far, the workflow’s looking pretty good. But there are still a few of things that could be better. For one, it’s not necessarily obvious to a user where to find their Pinboard API key (it took me a good, hard Googling to find it while writing these tutorials). For another, it can be confusing if there are no results from a workflow and Alfred shows its fallback Google/Amazon searches instead. Finally, the workflow is unresponsive while updating the list of recent posts from Pinboard. That can’t be helped if we don’t have any posts cached, but apart from the very first run, we always will, so why don’t we show what we have and update in the background? Let’s fix those issues. The easy ones first. To solve the first issue (Pinboard API keys being hard to find), we’ll add a second Keyword input that responds to the same pbsetkey keyword as our other action, but this one will just send the user to the Pinboard password settings page where the API keys are kept. and leave all the settings at their defaults. 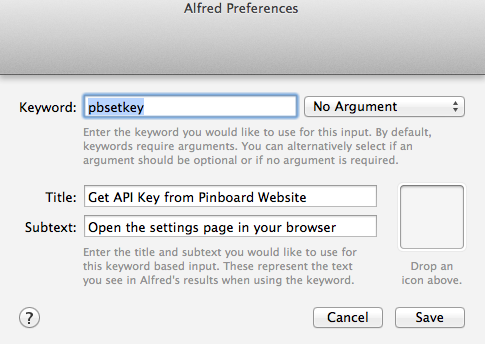 Enter pbsetkey into Alfred once more and try out the new action. Pinboard should open in your default browser. Alfred’s default behaviour when a Script Filter returns no results is to show its fallback searches. This is also what it does if a workflow crashes. So, the best thing to do when a user is explicitly using your workflow is to show a message indicating that no results were found. In lines 96-99, we check to see it there are any posts, and if not, we show the user a warning, send the results to Alfred and exit. This does away with Alfred’s distracting default searches and lets the user know exactly what’s going on. All that remains is for our workflow to provide the blazing fast results Alfred users have come to expect. No waiting around for glacial web services for the likes of us. As long as we have some posts saved in the cache, we can show those while grabbing an updated list in the background (and notifying the user of the update, of course). Now, there are a few different ways to start a background process. We could ask the user to set up a cron job, but cron isn’t the easiest software to use. We could add and load a Launch Agent, but that’d run indefinitely, whether or not the workflow is being used, and even if the workflow were uninstalled. So we’d best start our background process from within the workflow itself. Normally, you’d use subprocess.Popen to start a background process, but that doesn’t necessarily work quite as you might expect in Alfred: it treats your workflow as still running till the subprocess has finished, too, so it won’t call your workflow with a new query till the update is done. Which is exactly what happens now and the behaviour we want to avoid. Fortunately, Alfred-Workflow provides the background module to solve this problem. Using the background.run_in_background() and background.is_running() functions, we can easily run a script in the background while our workflow remains responsive to Alfred’s queries. Alfred-Workflow’s background module is based on, and uses the same API as subprocess.call(), but it runs the command as a background daemon process (consequently, it won’t return anything). So, our updater script will be called from our main workflow script, but background will run it as a background process. This way, it will appear to exit immediately, so Alfred will keep on calling our workflow every time the query changes. Meanwhile, our main workflow script will check if the background updater is running and post a useful, friendly notification if it is. At the top of the file (line 7), we’ve copied the get_recent_posts() function from pinboard.py (we won’t need it there any more). The contents of the try block in main() (lines 29–44) are once again copied straight from pinboard.py (where we won’t be needing them any more). The except clause (lines 46–48) is to trap the PasswordNotFound error that Workflow.get_password() will raise if the user hasn’t set their API key via Alfred yet. update.py can quietly die if no API key has been set because pinboard.py takes care of notifying the user to set their API key. As you can see in the 3rd line, update.py did its job. First of all, we’ve changed the imports a bit. We no longer need workflow.web, because we’ll use the functions run_in_background() from workflow.background to call update.py instead, and we’ve also imported another icon (ICON_INFO) to show our update message. As noted before, get_recent_posts() has now moved to update.py, as has the wrapper() function inside main(). Also in main(), we no longer need api_key. However, we still want to know if it has been saved, so we can show a warning if not, so we still call Workflow.get_password(), but without saving the result. Most importantly, we’ve now expanded the update code to check if our cached data are fresh with Workflow.cached_data_fresh() and to run the update.py script via background.run_in_background() if not (Workflow.workflowfile() returns the full path to a file in the workflow’s root directory). Then we check if the update process is running via background.is_running() using the name we assigned to the process (update), and notify the user via Alfred’s results if it is. Finally, we call Workflow.cached_data() with None as the data-retrieval function (line 66) because we don’t want to run an update from this script, blocking Alfred. As a consequence, it’s possible that we’ll get back None instead of a list of posts if there are no cached data, so we check for this before trying to filter None in line 80. Now let’s give it a spin. 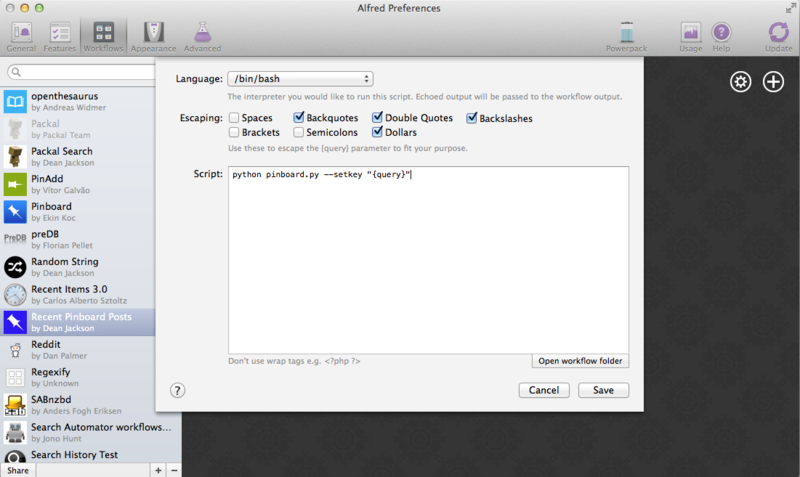 Open up Alfred and enter pbrecent workflow:delcache to clear the cached data. Then enter pbrecent and start typing a query. You should see the “Getting new posts from Pinboard” message appear. Unfortunately, we won’t see any results at the moment because we just deleted the cached data. To see our background updater weave its magic, we can change the max_age parameter passed to Workflow.cached_data() in update.py on line 42 and to Workflow.cached_data_fresh() in pinboard.py on line 69 to 60. Open up Alfred, enter pbrecent and a couple of letters, then twiddle your thumbs for ~55 seconds. Type another letter or two and you should see the “Getting new posts…” message and search results. Cool, huh? Now you’ve produced a technical marvel, it’s time to tell the world and enjoy the well-earned plaudits. To build your workflow, open it up in Alfred’s Preferences, right-click on the workflow’s name in the list on the left-hand side, and choose Export…. This will save a .alfredworkflow file that you can share with other people. .alfredworkflow files are just ZIP files with a different extension. If you want to have a poke around inside one, just change the extension to .zip and extract it in the normal way. And how do you share your Workflow with the world? There’s a Share your Workflows thread on the official Alfred forum, but being a forum, it’s less than ideal as a directory for workflows. Also, you’d need to find your own place to host your workflow file (for which GitHub and Dropbox are both good, free choices). It’s a good idea to sign up for the Alfred forum and post a thread for your workflow, so users can get in touch with you, but you might want to consider uploading it to Packal.org, a site specifically designed for hosting Alfred workflows. Your workflow will be much easier to find on that site than in the forum, and they’ll also host the workflow download for you. Software, like plans, never survives contact with the enemy, err, user. It’s likely that a bug or two will be found and some sweet improvements will be suggested, and so you’ll probably want to release a new and improved version of your workflow somewhere down the line. Instead of requiring your users to regularly visit a forum thread or a website to check for an update, there are a couple of ways you can have your workflow (semi-)automatically updated. The simplest way in terms of implementation is to upload your workflow to Packal.org. If you release a new version, any user who also uses the Packal Updater workflow will then be notified of the updated version. The disadvantage of this method is it only works if a user installs and uses the Packal Updater workflow. A slightly more complex to implement method is to use Alfred-Workflow’s built-in support for updates via GitHub releases. If you tell your Workflow object the name of your GitHub repo and the installed workflow’s version number, Alfred-Workflow will automatically check for a new version every day. By default, Alfred-Workflow won’t inform the user of the new version or update the workflow unless the user explicitly uses the workflow:update “magic” argument, but you can check the Workflow.update_available attribute and inform the user of the availability of an update if it’s True. See Self-updating in the User Guide for information on how to enable your workflow to update itself from GitHub. 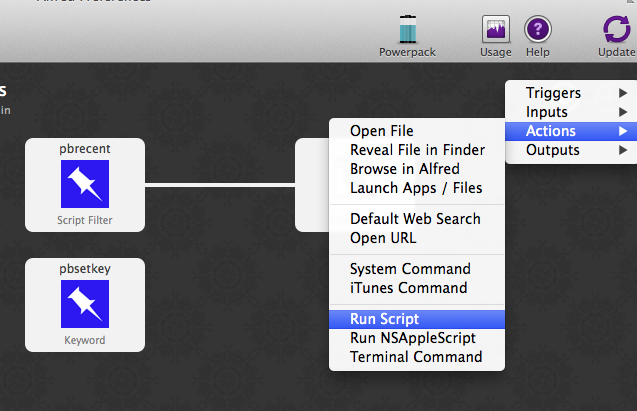 argparse isn’t available in Python 2.6, so this workflow won’t run on Snow Leopard (10.6).